It was close to a year ago when I first heard about German Shepherd Rescues and Adoptions. 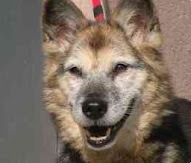 Lady, an older GSD (that's German Shepherd Dog), had no sooner become available than a generous soul from North Carolina had spotted her on SeniorPooch.com and wanted to know about her, if she got along with cats, and what would it take to adopt her. Lady was just getting over a bout of kennel cough and her foster didn't think it would be fair to ship her across the country without knowing if the Lady was cat-friendly and seeing what kind of environment that she'd be relocating. 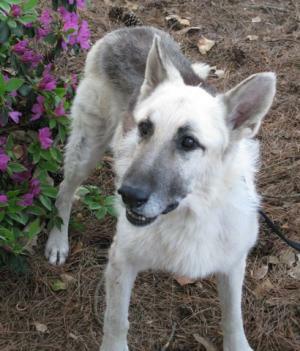 This is where I jumped in and did a quick search for "senior German shepherd North Carolina" and came up a link to: http://www.gsdrescue.org/ to forward to the person who contacted us. What impressed me the most was that they had a page especially set aside for Senior Adoptions, which not only includes adoptable pets, but also useful links that any senior dog owner would find helpful. SP: Why don't we start off by finding out a little about your role at German Shepherd Rescue and Adoptions? 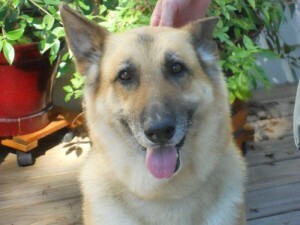 AP: My name is Andrea Portbury and I am the co-Director of German Shepherd Rescue and Adoptions, NC. I have been volunteering with GSRA since 2000, but adopted my first dog (a senior!) from the rescue in 2008. I have been co-Director (I share the head honcho position with a wonderful woman by the name of Jennifer Hall and we are both part of a 9 member Board of Directors) since about 2008. GSRA itself has been around since 1992! The Mission statement of GSRA is, "German Shepherd Rescue and Adoptions(GSRA) is an all-volunteer 501(c)(3) non-profit animal rescue organization based in Raleigh, North Carolina dedicated to saving the lives of homeless, abused and neglected German Shepherd Dogs and shepherd mixes (referred collectively hereafter as GSDs) as well as enhancing the public image of the breed." GSRA has about 150 volunteers and 45 foster homes spread throughout NC. We hold monthly adoption events where we invite approved adoption applicants and the public to come and mingle with our wonderful dogs. In order to be approved to adopt from GSRA you must fill out an online adoption application, submit to a phone interview and a home visit from an adoption counsellor, receive an excellent reference from your veterinarian and then be approved by the foster parent of the dog in which you are interested. GSRA is not interested in adopting out hundreds of dogs each year - we are instead focussed on ensuring that the dogs we DO adopt out land in the perfect home. It is very personal to us - because we can only rescue a handful of the GSDs in need in our area, we want to make sure that the dogs we do rescue end up living the life of princes and princesses in homes that understand the breed and will do whatever it takes to ensure the dog lives a long, happy, safe life. SP: I really like that your group has a special place in your hearts for seniors. What percentage of your rescues would you say are 7 or older? Where do you find them? AP: We started our dedicated senior dog program, A Moment in Time, a little over 3 years ago. I think in the first year we took in 5 senior dogs. Since then, our numbers have steadily increased. So far this year, the rescue has brought in 69 dogs total. Of those, 12 are over the age of 7 yrs, so we are looking at approximately 10% of the incoming dogs being seniors. As for where we find them - pretty much the same place we find most of our dogs: shelters, owner surrenders, Good Samaritans who either find the dog themselves, or take the dog into their home from a previously unsafe environment. SP: What are some of the common reasons that people give for getting rid of older dogs, or does it take longer to find suitable adopters? AP: As mentioned above, some people will give up their senior because they either can't or don't want to take care of the medical issues that crop up in an older dog. More often lately though, it has been financial reasons that has caused older family dogs to be taken to the shelter. We also get a fair number of "retired breeders" from backyard kennels that no longer produce puppies and so are dumped at the shelter. Sadly, because of the years of breeding, these girls (they are almost always females) end up with mammary tumors and complications with uterine infections. We picked up one gorgeous old girl from a shelter who was carrying around a 3lb mammary tumor. The person who dropped her at the shelter told us she was 12 years old - but he couldn't tell us her name as she never had one. We called her "Nanna". We removed the tumor but the cancer had spread pretty much everywhere. Nanna spent 3 glorious months being pampered and loved on before she let us know it was time for her to move on to the Rainbow Bridge. SP: What tips would you give to potential adopters/foster parents who are looking to take on older GSDs? Apart from those practical consideration, there is one other tip that I would offer to someone that is considering taking on an older GSD - and that is to SLOW DOWN :) And I don't mean the speed with which you walk :) What I mean is that a senior GSD has so much to offer their human, it is totally worth slowing down and watching how they experience life. The grace with which they handle the physical decline of their own bodies is amazing. They are way smarter than humans and usually find a way to compensate so they can still do the things they like to do. They are patient also. They don't get snippy when I a younger dog gets in their face or acts rambunctious. They simply stay calm and let that calmness transfer to the younger dog. SO much more effective than blowing up at the youngster or starting a fight! And the old adage of slowing down to smell the roses? I swear whoever came up with that knew an older GSD - because they DO tend to take in more on walks or when out and about. Spending time with a senior GSD is a real gift, but you have to be ready and willing to take advantage of it. SP: Are there any special health concerns that you commonly find? AP: As mentioned above, GSDs are well-known for their expensive illnesses. As they get older they usually develop arthritis in the hips, but also often times in the elbows. This can be particularly challenging for the owner as it is painful for the dog and can really limit the dog's movements. Luckily though, today there are so many supplements and pain meds on the market for dogs that it is become more and more easy to handle an arthritic dog. Older GSDs are also prone to hemangiosarcomas - tumors of the blood vessels that commonly form on the spleen. This is a very aggressive form of cancer and, if undetected will lead to splenic rupture and death from blood loss. Sadly, many GSDs also develop a neuromuscular disease called Degenerative Myelopathy. This is somewhat similar to ALS in humans. It starts with the dog dragging its hind feet but eventually progresses to complete paralysis of the hind end of the dog. There is no treatment unfortunately. SP: I find in all of my experiences that GSDs are smart, loyal dogs. What advice would you give someone integrating an older GSD into a family that might have another dog already? AP: Well first off, you want to make sure that the energy of the 2 dogs meshes well. Depending on the age of the senior, they may very well still be up for a good game of chase, but they will tire more easily - so you want to make sure that the senior dog is able to end the game when they are ready. Apart from that, I don't think there are any age-specific issues associated with integrating an older GSD into the home. Any new dog will want its space initially so they can get a feel for the home and the occupants. I think patience is key to any dog adoption though, regardless of the dog's age. I'd like to thank Andrea for her time and all of the good German Shepherd Rescue and Adoptions has done over the years on behalf of senior GSDs. Each animal you'll find on their website has their personal story wonderfully laid out so you really get a sense of each dog's personality and how much care and attention that Andrea and team take in placing each one in the perfect home. If you're looking to adopt a GSD of any age in North Carolina or you're a rescue organization who is struggling with communicating their mission, check them out. They know what they're doing.